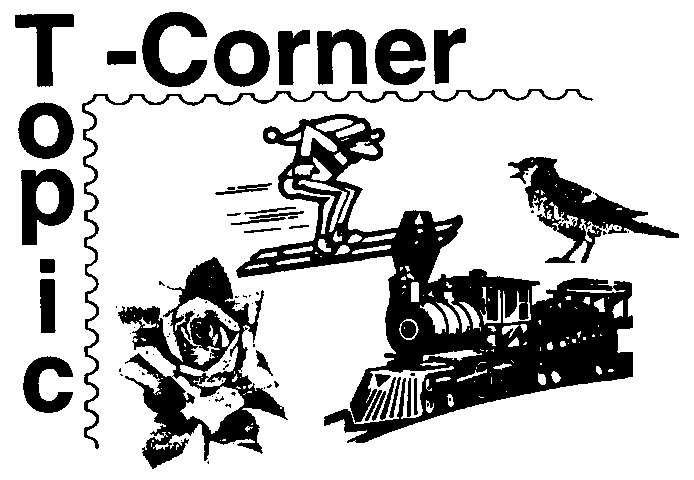 This page includes The Topic-Corner columns from the 2001 issues of Across the Fence Post. Coming soon - to a club near you - the second in a series of WFSC-produced mini-exhibit pages to be used for club and hobby promotion. This year the theme will be sports. The pages will be distributed in your club's mailing of the September issue of ATFP. The idea for the project was born when a member of the WFSC challenged the federation to help clubs promote the hobby. As originally conceived, a set of exhibit pages for WFSC member-club use would be created to complement the U.S. Postal Service's National Stamp Collecting Month theme. For the 2000 theme, however, it was felt there would not be enough other U.S. stamps related to the theme - deep-sea creatures. Thus, last year, the space theme was utilized to take advantage of the stamps that were issued for World Stamp Expo. This year, a similar problem was faced and possible topics were discussed at a recent WFSC board meeting. The conclusion was that sports would make an interesting subject for the pages. The plan is to create an eight-page exhibit using stamps and covers that can be easily obtainable by any club and its members. The philatelic material is to be mounted on the prepared pages, and the exhibit displayed at a local library, post office, school, or some other public place with the hope that it will attract both adult and youth noncollectors to the hobby. Each page will have a written narrative. This narrative will be either at the top or the bottom of each page to allow flexibility for mounting a variety of philatelic material: stamps, covers, plate blocks, souvenir sheets, etc. Although created with U.S. stamps in mind, those clubs and members having foreign issues that relate to the theme are invited to include such items in the display. The pages will be designed to suggest different themes related to the sports topic. There is no right or wrong way to prepare the pages. It is up to each club to create interesting pages for display. Here is where you can help me. Do you collect sports on stamps? Which sports would you like to see featured? Can you provide me with a listing of U.S, stamps that fit each of your selected categories? Do you have an idea for a unique title? Are there some interesting sports-related tidbits that would make interesting reading information for the viewer? Can you develop an interesting album-like page - perhaps borders - that relate to the sports theme? Likewise, are there some interesting philatelic facts related to the sports theme that could be used with the displayed U.S. stamps? I am interested in member input. Please write to me at P.O. Box 1451, Waukesha, WI 53187. Attracting new blood into the hobby is a problem facing the hobby. How can we hope to attract new members if they don't know of your club's existence? Visual stimulation can produce results. This year, try putting this exhibit on display along with information about your club's meeting place and time. Don't be surprised if you attract a member or two! The recent disasters of September 11, 2001, are on the minds of people everywhere. The cruel, senseless deliberate acts of terrorism have changed the peaceful world we have come to know. Yet out of these tragedies, the people of the United States have united in numerous ways. We have come together in support of our president, given blood, donated monies, volunteered time, and demonstrated our pride in this country with acts of patriotism. The terrorists may have rocked the foundation of our country and the walls of the World Trade Center may have come tumbling down, but I am confident that our spirit will prevail and democracy and freedom will reign over the world so children of the future can live in peace and happiness. During these trying times, the news coverage has been continuous. But interestingly, out of this scene of despair and sadness for the events that occurred, there were human-interest stories of hope, inspiration, friendships, and heroes. And, I noticed that I had turned to working with stamps as a source of comfort and relaxation during that difficult period immediately following the attacks. Our hobby provides an important source of knowledge of our world's geography and its history - something more Americans could certainly use. This got me to thinking about an American Topical Association contest that had been recently announced for youth. Why not, I said, promote a similar contest for the adult members of the WFSC. The rules are simple: Prepare a mini-exhibit of from one to four pages on some aspect of our country: its states, people, geography, symbols, historic events, culture, etc. Each entry must have an appropriate title. Other description is encouraged and should support research related to the topic. Submit a photocopy of the exhibit; colored photocopies are preferred. The subject can be general (e.g., presidents of the United States), or specific (e.g., the telling of the life and accomplishments of one particular president). The exhibit can be creative, such as using red and blue stamps to create a flag design. Some may want to try using stamps to illustrate the words of a favorite patriotic melody. The purpose of this exhibit is to show the pride and patriotism philatelists have for our country. 1 will approach the WFSC Executive Board about the possibility of displaying some of the contest entries at WISCOPEX '02. Possibly our editor may want to publish some of the entries in ATFP. Entries will be judged on originality, neatness, balance of material, write-up, eye appeal, condition of material, and appropriateness of material with regard to how it fits the topic and relates to the story being told. All contest entries must be postmarked by January 31, 2002. 1 have decided to personally donate a $50 savings bond to the winner (providing there are a minimum of 10 entries) and there possibly may be other philatelic prizes. If sufficient entries arrive, prizes may be awarded in different categories. Entries published in ATFP will receive a Lombardi first-day program. Individuals may prepare more than one entry. Clubs may decide to work on this project at a club meeting. Submit entries to: MaryAnn Bowman, P.O Box 1451, Waukesha, WI 53187.